It's almost seven years to the day (and many of those days were very grim indeed) since Taoiseach Brian Cowen was obliged to do a political 'Walk of Shame' into an EU summit. It was June 19, 2008, and the Irish had just roundly rejected the Lisbon Treaty in a referendum, a move which rapidly demoted us from the status of eurozone wunderkind straight onto the 'Euro Naughty Step'. And that was just the start of our economic Ice Age - a period where the beady-eyed EU overlords chucked us in the same Hell-bound handcart as Portugal, Greece and Spain, a quartet of banjaxed PIGS. Seven years on, if Taoiseach Enda Kenny wasn't quite executing a 'Stride of Pride' through the doors of the European Council HQ when he arrived in Brussels yesterday, he certainly wasn't the uncomfortable eye of a euro-storm either. Ireland is doing nicely without the tender ministrations of the Troika, thank you. As are Portugal and Spain. This week's EU-CELAC (Community of Latin American and Caribbean States) summit is a very large pow-wow, involving the 28 member states of the European Union plus 33 Latin American and Caribbean countries, which adds up to over one billion people and more than €200bn in total trade. 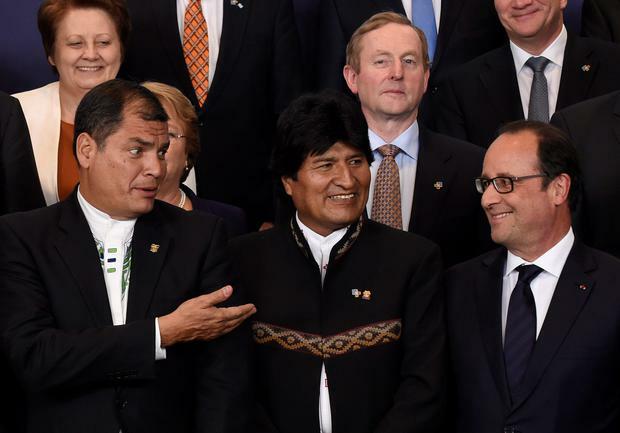 The plan was to get busy with all sorts of new trade deals between the two areas - the Taoiseach had scheduled bilateral side meetings with the respective presidents of Chile, Colombia and Mexico. But there was little time for chit-chat over Cuban cigars and Argentinian wine - for all the attention of the EU bigwigs was firmly focused on Greece - the final remaining letter in the handcart. A rather intense game of chicken is in full swing between Greek Prime Minister Alexis Tsipras and the hard lads who possess the keys to the EU coffers. The hard-left Syriza government want wholesale debt relief and string-free bailout dosh, but the hardy boys reckon Greece can go sing for more cash unless they agree to don the horrible 'Hairshirt of Austerity' which is all-too familiar to the Irish. As he arrived at the summit, even the Taoiseach - head of a country which not so long ago was 'I' to Greece's 'G' - sounded a stern note. "Since the new government was elected in Greece, at every European Council meeting there have been offers of support and assistance from leaders around the table," he said. "But time is running out. That support and encouragement still remains, but it's a case of the politicians in Greece being able to be creative with the way they deal with the situation. Obviously this can't continue indefinitely, it's always in a state of pretty serious flux," he added gravely. But there was no sign of shame in the walk of Alexis Tsipras when he arrived at the summit. Tieless and sporting a wide, boyband-style grin, he was immediately embraced by EC president Jean-Claude Juncker. Alexis was basking in the sort of attention which only serious brinkmanship by a totally skint member of the EU attracts. But away from the cameras, the hardball haggling was under way. German Chancellor Angela Merkel once again waded into the sea of testosterone and began some intense shuttle diplomacy. There was a flurry of side meetings, with Tsipras and Juncker, Tsipras and Hollande and Merkel. The gloom began to lift a little as hints trickled out that both sides were inching away from their respective entrenched positions. The poor oul CELACs barely got a look-in. Yesterday, Greece was the word.